The Shenandoah River flows through the valley to the west, with Massanutten Mountain, 40 miles long, standing between the river's north and south forks. The rolling Piedmont country lies to the east of the park. Skyline Drive, a 105-mile road that winds along the crest of the mountains through the length of the park, provides vistas of the spectacular landscape to east and west. The park holds more than 500 miles of trails, including 101 miles of the Appalachian Trail. Trails may follow a ridge crest, or they may lead to high places with panoramic views or to waterfalls in deep canyons. Many animals, including deer, black bears, and wild turkeys, flourish among the rich growth of an oak-hickory forest. In season, bushes and wildflowers bloom along the Drive and trails and fill the open spaces. Apple trees, stone foundations, and cemeteries are reminders of the families who once called this place home. 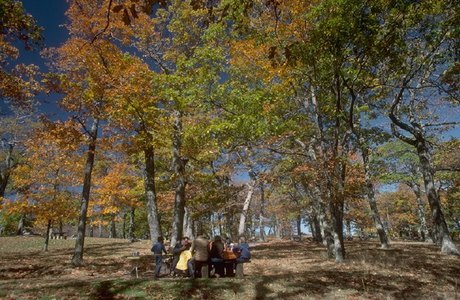 Shenandoah National Park has many stories waiting to be told, and a world of beauty that can renew and bring peace to the spirit.